Yes!! Freaking love it! And immiscible, what a delightful word!! What would you give to have people freaking love your content? The pointers here come from a talk that Jay Lauf, co-president and publisher of Quartz, gave at Content Marketing World: Deconstructing Quartz (QZ.com): How One of the Most Popular Mobile Destinations Grows Audience, Extends Reach in Digital, and Creates a Superior Content Experience. They base their stories on their audience’s obsessions. They surface each story’s “Thing” (kernel of interest). They nail their company’s voice. 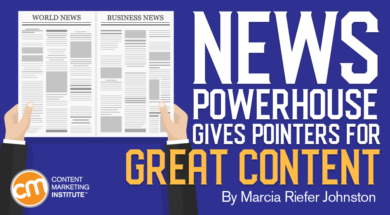 Does your content team base its stories on what your company wants to talk about? Or do you dig into topics your audience is obsessed with? 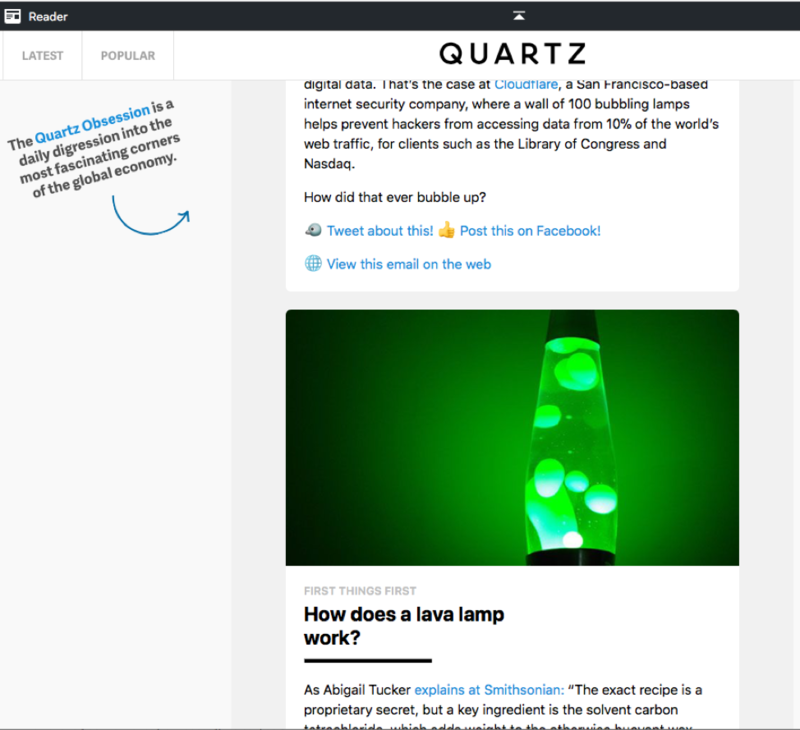 Last September, Quartz launched an interactive email newsletter called the Quartz Obsession. Each weekday, this newsletter delves into a topic a Quartz writer found fascinating (and thought the audience would too). The newsletters inform and entertain, mixing stories and facts with GIFs, videos, quizzes, and polls. The writers have fun with language – asking in the lava lamp article, “How did that bubble up?” – while going deep and wide into their topics with a diligence and delight evident in only the most avid explorers. 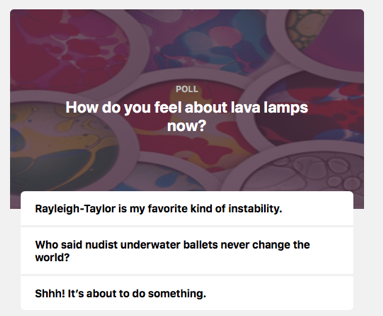 What obsessed reader could resist a poll like this one, which appears at the end of the lava-lamp Obsession article? I can’t believe that the middle line beat out the clincher: “Shhh! It’s about to do something.” Genius. “What are your target audiences obsessed with,” Jay asks. Focus your content on those areas and hire content creators who are obsessed with the same things. As your team develops a story, are you satisfied with telling it straight? Or do you dig for a riveting nugget at the story’s core, something that others might never think to call attention to? We have a Things team … In any article or piece of content we put out, we look for the one Thing, the magic Thing that’s interesting about it, and we surface that. Often, the writer will create a headline and craft a tweet or two before writing the article. If all a writer can come up with is boring (and prompts thoughts like “No one’s going to click on that. No one’s going to share it. No one’s going to like it,”), then the writer hasn’t yet uncovered the Thing – the kernel of interest – inside the story. Who’s going to read those? Inaccessible armholes?! Who isn’t going to read that article? The thing about a story’s Thing is that it must be earned. You don’t just stick something in the headline to grab attention gratuitously. You do your homework. 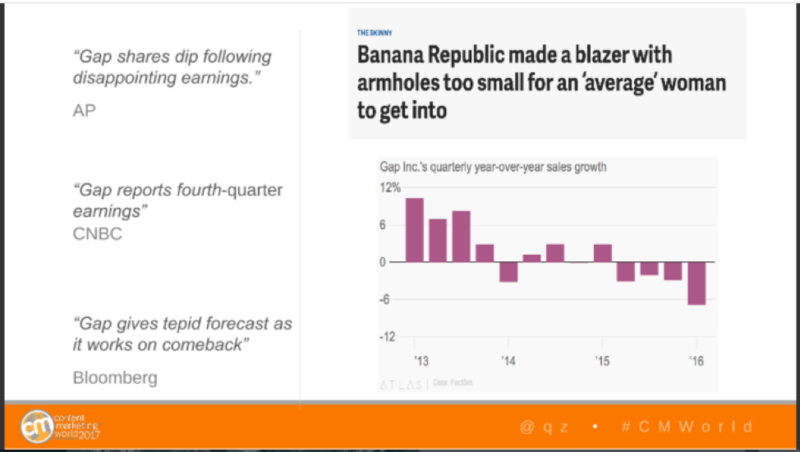 In researching this story, the Quartz reporter discovered that Gap’s numbers were off partly because of Banana Republic’s performance. And one of the reasons Banana Republic’s performance was off was that its manufacturing and production had slipped. Another part of letting your content shine is getting the voice right for your audience and purpose. 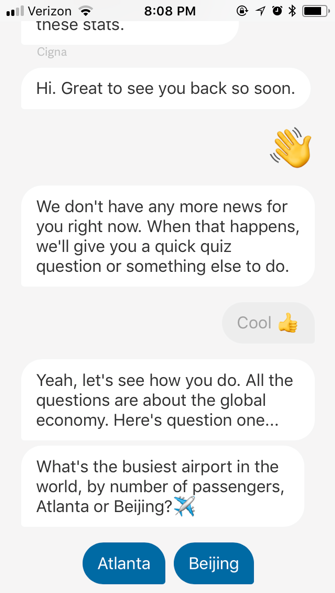 As innovative as the Quartz team was in creating the world’s first app to deliver news instant-message style via chatbot, that inventiveness alone doesn’t explain why customers love the app. Customers love it (see Jay’s talk for testimonials) because of its conversational voice. How many news sources say things like, “Great to see you back so soon,” and “Yeah, let’s see how you do”? How many news sources enable you to respond with a waving-hand emoji or a “cool”? Jay isn’t suggesting everybody adopt a voice like this. 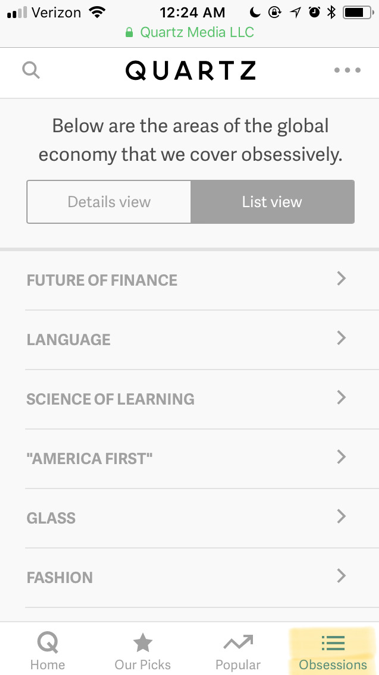 Quartz understands its audience. Quartz aims for younger executives more than traditional media outlets do. The Quartz voice reflects the organization’s culture and the sensibility of the readers who keep coming back. Jay’s advice to marketers: Whatever the personality of your company, “deploy it aggressively” in your content. Does your team base its stories on your audience’s obsessions? Do you and your colleagues dig for each story’s unique kernel of interest and then bring that “Thing” to the headline? Have you nailed your company’s voice? If so, you’re well on your way to a level of content performance that few companies experience. Tell us about it in a comment. Get engaging insight and practical how-to advice from the 100-plus speakers at Content Marketing World Sept. 4-7 in Cleveland, Ohio. Register today and use the code BLOG100 to save $100.